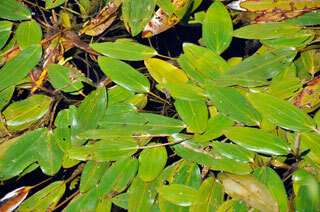 Stems: To 60 inches, terete, branched. Leaves: Cauline, alternate or nearly opposite distally, simple, both submersed and floating, or floating absent; parallel-veined, glabrous; petiolate. Submersed leaves with stipules pale brown, conspicuous, 1.2 to 3.5 inch, free from blade; petiole .8 to 5 inches; blade linear-lanceolate to elliptic-lanceolate, 3.5 to 8 inches long, .4 to 1 inch wide, veins 7-15, apex acute. Floating leaves with stipules 1.2 to 4 inches; petiole 1.6 to 8 inches; blade elliptic to oblong-elliptic, 1.2 to 4.4 inches ling, .6 to 1.8 inch wide, veins 9--21, base wedge-shaped to rounded, margins entire, apex acute to rounded. Inflorescences: Inflorescences spikes, terminal or axillary, emersed, cylindric, .8 to 2.4 inches; peduncles 1.2 to 5.9 inches. Flowers: Radially symmetric; tepals 4; stamens 4; pistils 1 or 4. Fruits: Reddish brown, obovoid, .1 to .17 inch, beaked, sides rounded, abaxial keel sharp, lateral ridges low. Habitat: Usually in shallow water of ponds, lakes, streams, and marshes. Comments: Potamogeton, river + neighbor, alluding to the habitat and nodosus, knotty, alluding to the coarse clusters of fruits.